Ambiguous claims like "Finest Quality" or "Standardized" or "Extra OPC" are dubious to the trained observer who is left guessing about the origin and composition of the ingredients, and in which country and according to what standards it was produced. So, because there is no industry standard, most so-called "OPC" products contain unidentified and untraceable extracts typically labeled vaguely as "grape seed extract" or "pine bark extract." Even the trained observer is left guessing about the origin of the ingredients, method of production, and in which country and according to what standards it was produced. 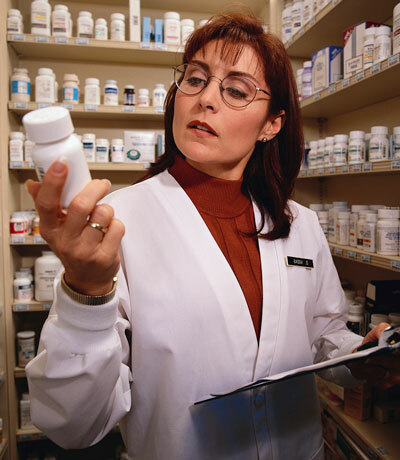 Nevertheless, sellers of these so-called "OPC" products are currently borrowing research conducted on other products to support the efficacy of their own. The differences, if even known by the seller, are conveniently left unmentioned and consumers have little or no means to make the distinction. OPCs are very complex (much more than other phytonutrients) so there is as much confusion as there are commercial opportunists. The result is pandemic misinformation. Sellers advertise "grape seed extracts" as antioxidants and Free Radical Scavengers (referring to Jack Masquelier's U.S. Patent No. 4,698,360) in spite of the fact that their products have almost nothing in common with the scientific methods used for that patent. 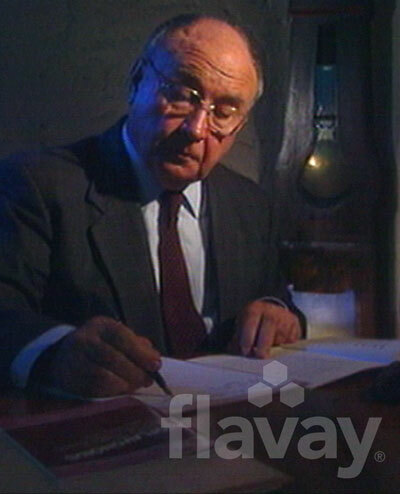 (Above:) Dr. Jack Masquelier (Bordeaux, France), inventor of the patents for the isolation, identification and application of oligomeric proanthocyanidins (known also as pycnogenols). Whereas grape seed extracts contain bioflavonoids (the subgroup of flavonoids and an enormous and extremely complex and varied category), these are known to be mutagenic in large amounts therefore untested extracts may be dangerous to your health. 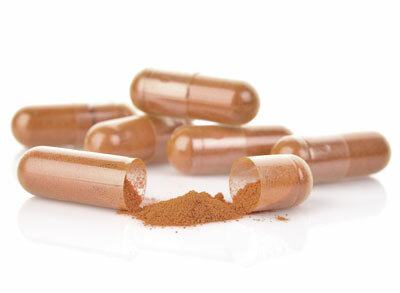 However, the highly defined Flavay® has been tested as a medicine for safety. Manufactured in France under the strict standards set forth by the French Ministry of Health, Flavay® has undergone intensive biological, toxicological, pharmacological and analytical research for the purpose of registration as a medicine in France. Rigorous testing to meet the standards required by the health ministries of France, Germany and other European countries demonstrate that Flavay® is 100% bioavailable, nontoxic, nonallergenic, noncarciogenic, nonmutagenic and is completely safe. In the 1990s, when the American natural foods industry learned about OPCs and of Dr. Masquelier's work in France, they engulfed it under a tidal wave called "grape seed extract" and manufacturers popped up everywhere. But there is no relevant pharmaceutical, nutritional, biochemical or analytical definition of "grape seed extract" nor is there one standardized manufacturing method. There are no commonly accepted, clear analytical "fingerprints" for qualifying grape seed extract. In fact the term is so broad and so vague that "grape seed extract" can and does mean just about anything. Unfortunately the demand for grape seed extracts was created by using vague and general references to the work of Dr. Masquelier and his colleagues. 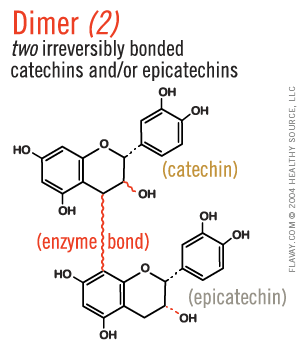 The tragedy is that the vast majority of purchasers of grape seed extracts, "OPCs," and branded pine bark extract believe they are buying the same product that was invented and researched by Dr. Masquelier and registered in France by the French Ministry of Health. Nothing could be further from the truth. Only Flavay® is the pure and unadulterated formulation of OPCs which has been awarded patents for manufacturing and for vascular protection in France. 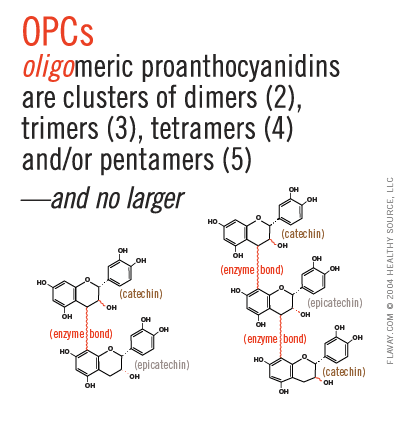 What are Oligomeric ProanthoCyanidins (OPCs)? Oligo (small) Pro (before) antho (plant) Cyanidins (with red pigment). Oligomeric proanthocyanidins (OPCS) refers to specific plant chemicals which are small and before color (and for that reason, colorless). Unlike other nutrients which are are comparatively simple, OPCs are very complex and require specialized knowledge and technology in order to be accurately identified and quantified. 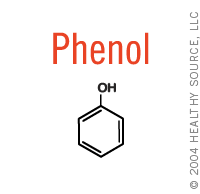 Not all proanthocyanidins are healthy for consumption. 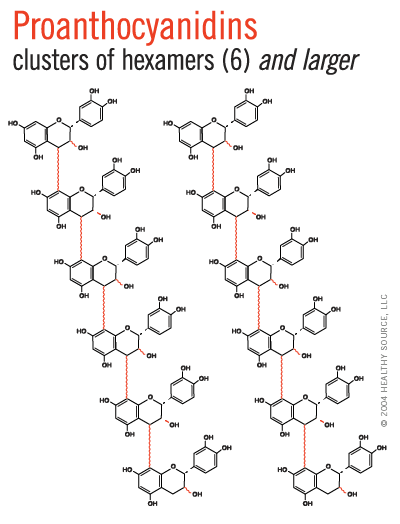 Only the small proanthocyanidins are healthful, and these are known as oligomeric proanthocyanidins, or OPCs. "Oligo" means few or small. 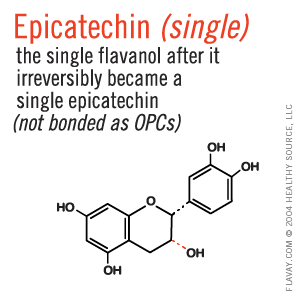 Where the single catechins and single epicatechins are highly beneficial in OPCs, the same molecules are nonnutritive when isolated. OPCs are highly perishable when isolated from other substances called organic acids. 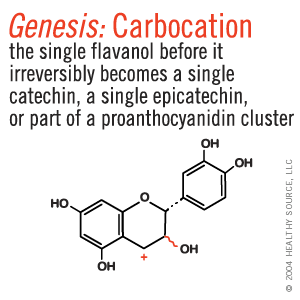 Therefore, Flavay® retains small amounts of these organic acids (including caffeic acid, cinnamic acid, fumaric acid, gallic acid, vanillic acid) as these preserve the OPCs and significantly contribute to the beneficial effects of Flavay®. 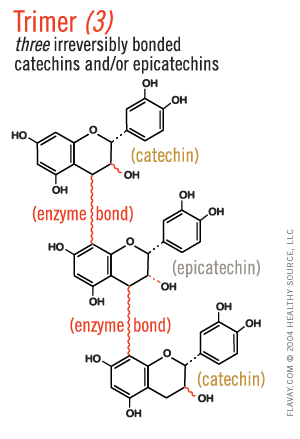 The vast majority of producers of grape seed extracts (and pine bark extracts) leave the majority of the large proanthocyanidins molecules in their products in order to bulk up the weight and then allow the consumer to wrongly believe they are consuming OPCs. The science of manufacturing Flavay® is complex. 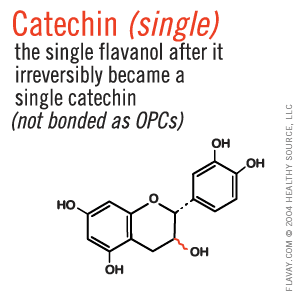 Where the single flavan-3-ol molecular groups are highly beneficial, the same molecules are nonnutritive when isolated from their natural partners. So, organic groups of singles and small-clusters of specific molecules are selectively preserved while antinutritive large-clusters of molecules are removed. Organic acids are retained to preserve bioactivity in the otherwise highly-perishable molecular complexes. 90. Yu, C. L. et al. Mutagenicity of proanthocyanidins. Food Chem. Toxicol. 25(2):135-9, 1987. 91. Pantaleoni, G.C., Quaglino, D. Univerisity of Aquila Pharmacol-Toxicologica Report, 1971. 92. Laparra, J., et al., Acta Therapeutica, 4:233, 1978. 93. Volkner, Wolfgang Muller, Ewald, Micronucleus assay in bone marrow cells of the mouse with pycnogenol. Cytotest Cell Research GmbH & Co., projects 143010 & 143021; Feb. 1989. 94. Acute and chronic toxicity tests. International Bio-Research, Inc., Hanover, Germany, 1967-1971. Copyright © 2004-2019 Healthy Source LLC.